Joanna says I have little patience, and she is right. Several weeks ago she reported that we had, for the first time since we’ve been here at the farm, a small group of Painted Turtles living in the pond below the house. She said that it would be nice if I could get a picture of one. She immediately thought about what she had said and added, No, you don’t have the patience. Over the next few days, and whenever I had the opportunity, I would scan the edge of the pond for turtles and, on several occasions they presented themselves, but whenever I would get down off the tractor or mower for a better look, they would dart away. Even when I displayed infinite patience and approached quietly, and on foot from a distance, it was clear that the turtles were very aware of movement at the edge of their newly adopted home. My solution was to construct a bit of a blind by laying a few ends of plywood down at the water’s edge and across from a spot that I thought would provide both a suitable place for turtles to bask and a nice backdrop for a photo. So, with my blind established, and while Joanna was away, I surprised myself by sitting along the edge of the pond, hiding among the Cat Tails, for a bit more than an hour. I saw no turtles, but I did demonstrate what was, for me, an infinite amount of patience. 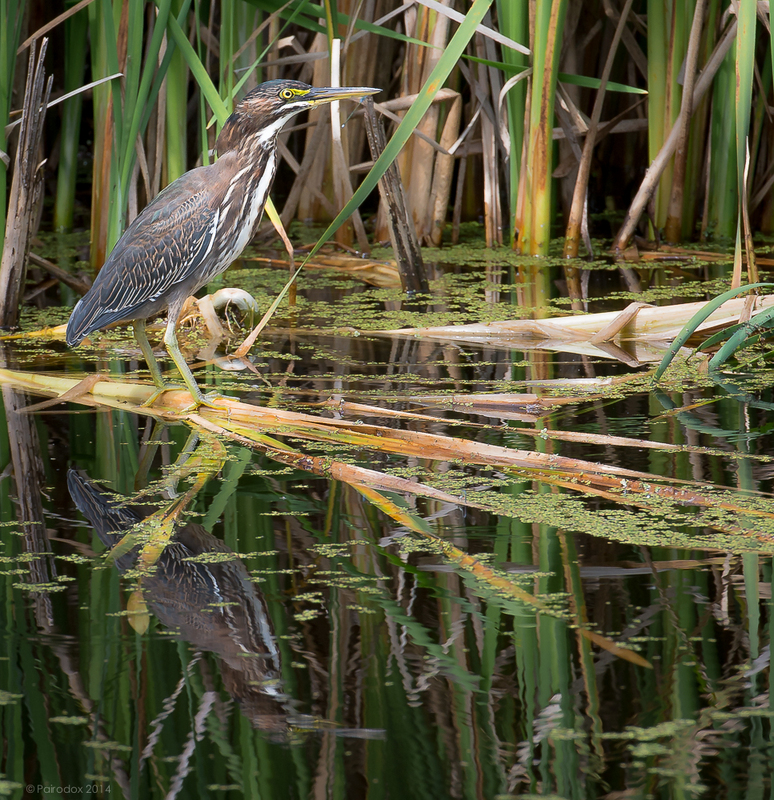 Yesterday Joanna walked up from the pond and said that she had spotted a young Green Heron. She suggested that I get the camera and, if I approached quietly, I might be able to get a nice shot of it. And so I did … and did!